A World of Trouble is the third of Jake Needham's "Jack Shepherd" novels set mostly in Thailand (though both this book and the previous one, Killing Plato, range pretty far afield). At the end of the previous book, Jack is seemingly at a dead end: his wife has left him and everything else has fallen apart, too. At the beginning of A World of Trouble, he's not much better off. He has moved to Hong Kong, but his only client is a former Prime Minister of Thailand who's now in exile in Dubai, and Jack is in Dubai with his client (also the 98th richest man in the world, as it happens). Jack is a financial expert, but his management of he ex-Prime Minister's vast wealth gets a little complicated when Jack is asked to get a very large sum out of Thailand and is required to travel to Bangkok to manage the deal. Several characters from previous books (including a cop and a couple of contrasting characters from the Thai intelligence agency) come into the plot as Jack deals with the Prime Minister's business as well as his own demons. Needham is good at making the Shepherd stories focus around Jack's financial expertise even as the story veers into politics and violence. This time, the story involves enough (and realistic enough) Thai politics that the author feels it necessary to assert on his own blog that no one should seek any parallels between his book and the real Thailand. It's to the author's credit that the disclaimer is necessary: A World of Trouble draws a completely believable portrait of a society on the verge of collapse, and of the meddling of certain American agencies in the process. But the story doesn't go for the thriller-cliché. Just as it seems that Jack will be thrust against his will into the role of hero, the story takes a different turn (which I won't reveal) and heads into more realistic (though not cheerful) direction. That less-than-cheerful ending, though, doesn't alter one of the chief charms of the series: though the stories are told in the third person, most of the action is told in dialogue or from Jack's point of view. Both the narrator and Jack himself are charming company, as well as moving the story forward briskly. There's a lot of back and forth from country to country (along with interesting glimpses of exotic locations) and a lot of financial and political dealings, but the story never bogs down or drags. 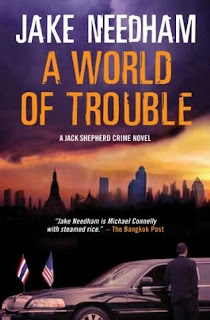 So I highly recommend A World of Trouble to readers of international crime: the series is quite different from other Bangkok-related crime series. The physical books are apparently only available in certain Asian countries, but fortunately there are digital editions available to us in the rest of the world. In fact, I read the book via a Kindle version that the author sent me for review, but rather than reading it on a Kindle, I read it via an iPod Touch. You might that the screen is too small to read a whole book, but I'm getting quite used to it after reading about a half-dozen books that way. It requires turning the page quite a lot, but anyone who has ever gotten fascinated by very small book formats will be quite comfortable with the Touch screen (and for readers of i-books in formats other than Kindle, there's now an app that makes Adobe Digital Editions readable on the non-flash Touch device.